Due to the outstanding performance, elegant model and incomparable comfortable, Lincoln car has always been elected as the special Limousine for President in the White House since 1939. The most famous brand of Lincoln is the car used for troops review by President Kennedy. There are also famous brand products, such as Continental Mark Ⅷ, Town Car, Navigator and so on. The design of Lincoln trademark is unique. It is a rectangular contained a sparkling star. 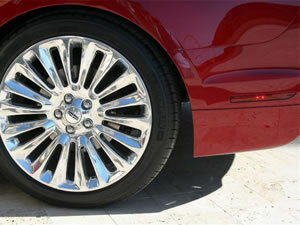 Lincoln wheel rim is adopts this style. The wheel adopts the full-time raider drive mode. Lincoln wheel rim is made of steel. In addition, the full size spare tire can be available. Lincoln wheel rim is adopts this style. The wheel adopts the full-time raider drive mode. Lincoln wheel rim is made of steel. In addition, the full size spare tire can be available. Wuxi Hengsheng Wheel Co., Ltd is a professional Lincoln wheel rim manufacturer and supplier in China. In addition to Lincoln wheel rim, we also provide other famous models steel wheels (rims) for our clients around the world, like Audi wheel (rim), Buick wheels (rims), Cadillac wheel (rim), Chevrolet (GMC) wheels, Chrysler (DODG, PLYMOUTH) steel wheels, Daewoo wheel, FIAT style wheels, etc. We possess a professional technology team to guarantee the manufacturing of Lincoln wheel rim. We will checkout all the products and give out a survey report. According to the needs of every client, there will be a dynamic balance sample survey among parts of the qualified Lincoln wheel rim.